It may be only a few weeks ago when you started planting tomatoes. Or that you are planning to grow this fruit* for the very first time. Either way, there is one important fact you need to know – the presence of worms. Yes, expect the obvious that can happen from time to time. But this doesn’t mean you cannot prevent it. There’s always a way to get rid of pests and in this case, this type of worm. *Tomatoes are botanically fruit but regarded as vegetable when added or cooked to dishes. How do tomatoes get worm? Where do tomato worms come from? With these questions, we have a guide on what to discuss on this post. Where Do Tomato Worms Come From? Tomato worms, or commonly called as hornworms with the scientific name manduca quinquemaculata, are a type of caterpillars. It’s named due to its tail that similarly appears horn. They’re one of the largest caterpillars extending up to 4 inches long. Smaller worms are yellow and sometimes white without any markings, while mature or large ones become green with eight white V-shaped marks. Tomato worms like to be fed on solanaceous plants, which include eggplants, potatoes and bell peppers other than tomatoes. So, it’s not only tomatoes that you have to worry about if in case you have other vegetables in your garden. Where do tomato worms come from is based on a butterfly’s life cycle, or more specifically moths. During the last few weeks of spring, moths start laying eggs on the leaves of the plant. It takes only a week for the eggs to hatch and transform into caterpillar larvae. After 4 to 6 weeks, they begin creating a cocoon by dropping off the plants and burrow themselves into the soil for pupation, which makes it a perfect time to escape the winter. Since there are different types of moths, it is easy to identify whether which can become hornworms. The moths that are responsible for tomato worms are usually large, featuring mottled gray-brown color and yellow spots on the abdomen sides with narrow front wings that can spread up to 4 or 5 inches and that blend light and dark banded hindwings. 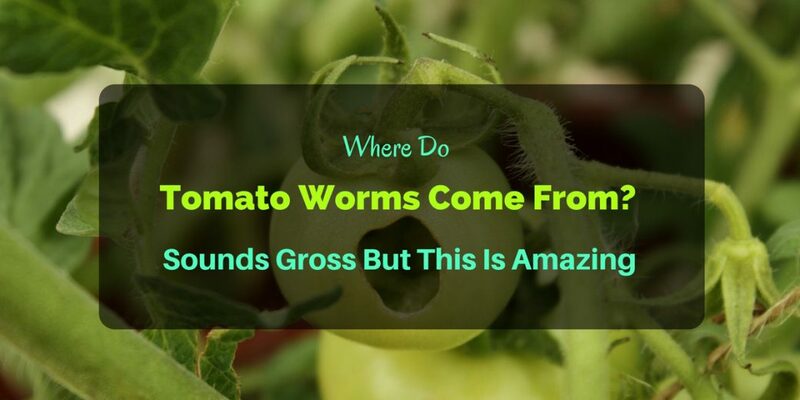 Does it sound amazing where do tomato worms come from? It is indeed incredible to see creatures form like that. But let’s not forget that worms on plants, especially on tomatoes, can do damage. These hornworms feed on the leaves so that’s the major damage they cause to the plant. But in more than one occasion, they would also most likely eat the fruits. The larger they become the more damage they bring. This is when defoliation increases and possibly triggers the plant to die. Therefore, suspect these worms are present during spring particularly when there are several holes on the leaves, devoured flowers and even damaged fruits. At this point, where do tomato worms come from doesn’t matter. You must be careful and aware whether your plants are infested or not. From afar, it’s not that easy to identify the worms. You have to go for a closer look since their green color blend in with the leaves. Do not wait before most of the leaves or the entire plant is on the verge of dying before you deal with this problem. It’s best to check your plants twice a week. There are several measures on how to get rid of hornworms. Here are some quick tips to bear in mind. 1. Regularly water the plants to grow fast and sustain the nutrients they need. 2. Remove weeds, broken or dead leaves. 3. Till the soil after harvesting to destroy burrows or pupaes of the caterpillar. 4. Once spotted, use a tweezer or any tool to pick the worms, unless you’re comfortable of handpicking, from the leaves. Soak them in water with soaps until they are killed. 5. Cover almost grown or ripe fruit with a plastic or brown bag for extra protection. ​6. For a large infestation, the use of insecticides (preferably organic) can be applied. 7. Place basil, dill or marigold around tomatoes to discourage worms. It is fascinating how butterflies or moths are formed. But this is how or where do tomato worms come from. You may appreciate the beauty and presence of these wonderful winged insects but be also prepared during the stage where they lay eggs as the growing of worms can be your plant’s number one enemy. For sure, you want to harvest as many tomatoes at the end of the day.